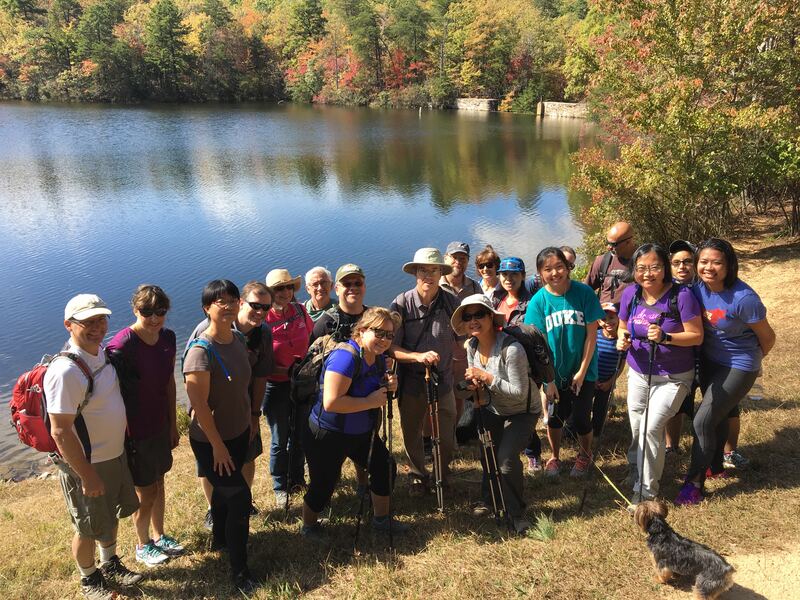 Take a walk with us on the wild side - GetGoing NC! We love the idea of exploring the wild places out there. But actually doing it can be daunting. 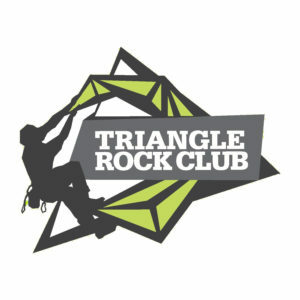 The wildest place we know of in the Southeast is Linville Gorge. Most of the 11,651 acres is wilderness. The gorge is just three-quarters of a mile across, from rim to rim, and is as deep as 1,500 feet in spots. On its 13-mile run through the gorge, the Linville River drops 2,000 vertical feet. So inaccessible is much of the gorge that it contains virgin timber, a rarity in this part of the world. 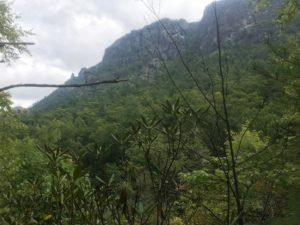 Trail descriptions are peppered with such phrases as “very strenuous,” “very primitive,” and “notoriously steep.” There is no “easy” in Linville Gorge. Looking up from the Linville River to The Chimneys. That makes its spectacular scenery all the more desirable. One of my most memorable views of the past couple years was from a spot along the Linville River not far from Pinch-In Trail. I glanced across the river and up, up about 1,900 vertical feet to The Chimneys, a prominent rock outcrop that loomed like the prow of an ocean liner over a row boat. To earn this view, I had descended, in full pack, the ridiculously steep, roughly defined Leadmine Trail, then hiked up the boulder-choked Linville Gorge Trail. It was laughingly slow going. But then this view. 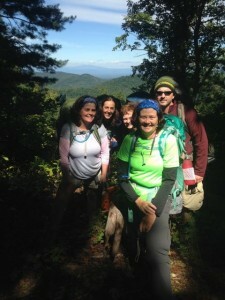 Not every backpacker, I realized as the eight in my group wrestled with the trail, is ready for this level of adventure—at least in full pack. 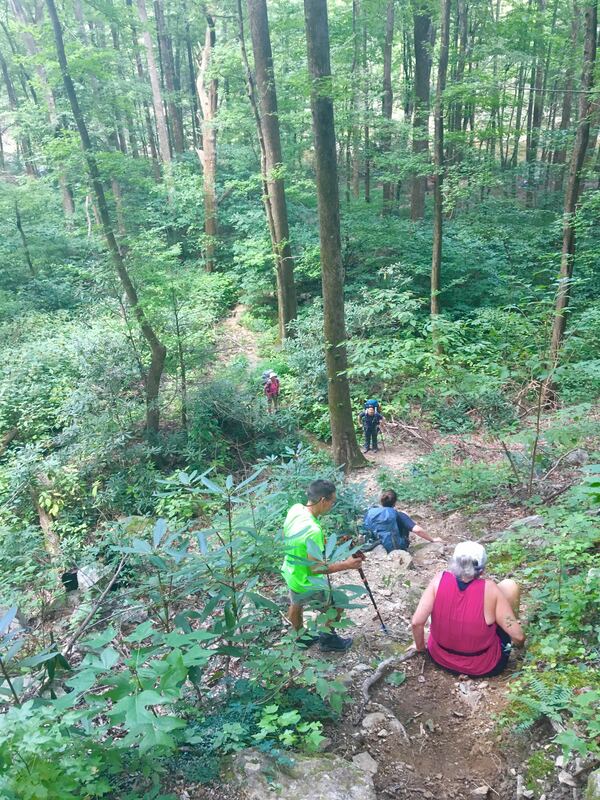 Friday afternoon, we’ll hike in from the Wolf Pit Road access at the southeast end of the gorge. It’s a steady climb, but at just 1.7 miles, it’s doable even for a backpacking novice. We establish basecamp on Shortoff Mountain, in the vicinity of “Camp Shortoff,” where a run of rock outcrops affords some of the best views of the gorge and some of the best sunsets imaginable. Saturday, we don our day packs and hike about 3 miles north on the Mountains-to-Sea Trail, the flattest 3 miles of trail in Linville, brushing the rim, with more great views of the gorge. 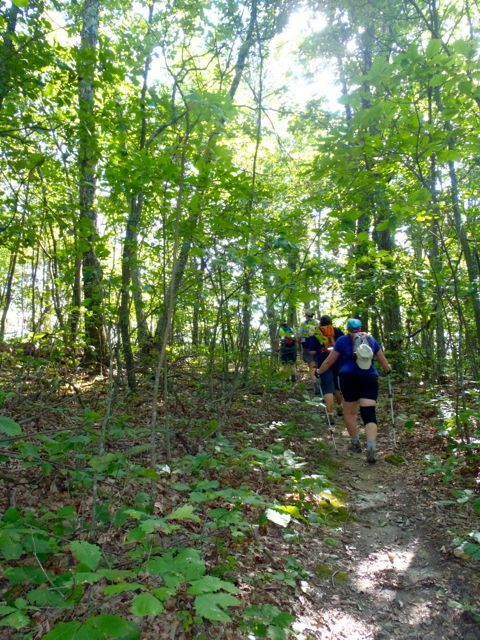 At the 3-mile mark we descend on the Cambric Ridge Trail, which drops, quickly, a little more than a mile down to the river. You won’t see this trail on most maps; it’s one of the primitive trails that are all but hidden in the gorge. We’ll take it down to the river; if the water level is low, we may cross and head downstream and loop back up to basecamp. If the river is up, we’ll hang out, have lunch, maybe take a dip, before heading back to camp. We’ll be in the heart of the gorge, in an area that’s infrequently visited. Saturday’s hike, about 9-10 miles in all, is a good way for a person to get a feel for experiencing challenging terrain before tackling it in full pack. Even for someone who’s day-hiked rugged areas, doing it as part of backpacking expedition helps put such terrain in a backpacking perspective and thus prepare better for venturing out in full pack. 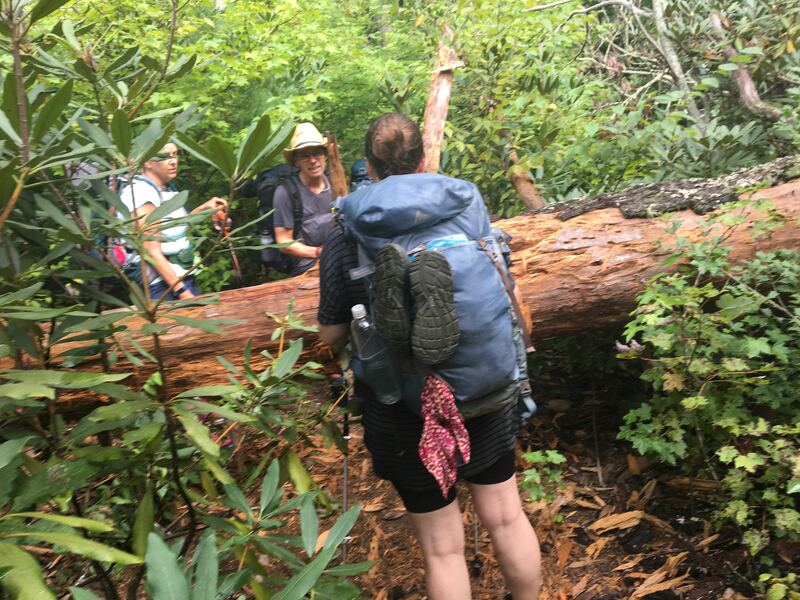 Downed hemlocks—and there are a goodly number of them—are fairly easy to scramble over in a day pack, but what about in a 60-liter pack carrying 30 pounds? Perhaps pare down the load. How about those steep descents? 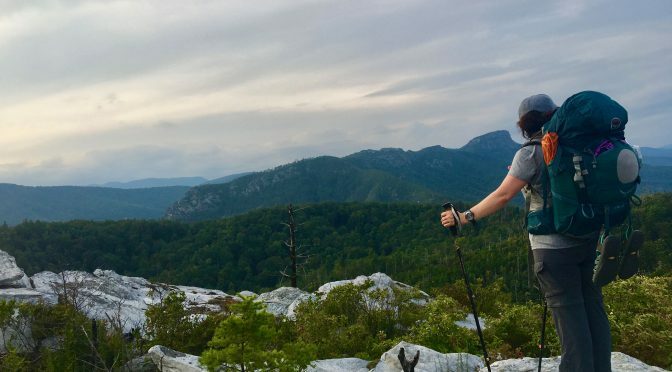 Maybe you don’t use trekking poles on day hikes, but think about all that weight and its impact on your knees dropping down a trail with a 45-degree descent. We backpack so we can spend as much time as possible on the trail, not because we’re into being punished. A basecamp approach is the ideal marriage of backcountry camping and hiking, especially well-suited to our wildest places. Learn more and sign up for our GetBackpacking! An introduction to Linville Gorge, here. We also have a somewhat similar GetBackpacking! 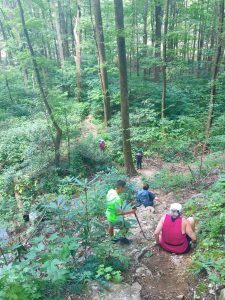 trip planned to the Joyce Kilmer-Slickrock/Citico Creek Wilderness for Oct. 25-28. Learn more about it and sign up here.